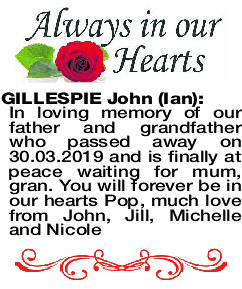 The Funeral Cortege for Mr John (Ian) McCormack Gillespie will arrive at PINNAROO Valley Memorial Park, East Chapel for a Cremation Service on WEDNESDAY (10.4.2019) commencing at 10.30am. My Dad! 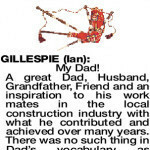 A great Dad, Husband, Grandfather, Friend and an inspiration to his work mates in the local construction industry with what he contributed and achieved over many years. There was no such thing in Dad's vocabulary as "I can't" because there was always a solution and he found it. Dad, you have been my rock, with you beside me I felt nothing was impossible. You have left an incredible legacy, I am so proud to have been your son. 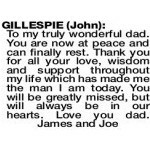 I know even now you will have your, Toblerone scale ruler out with your clutch pencil re - designing the pearly gates ready for Mum completed on time and Budget. Dad, we will miss you, you will always be in our thoughts, rest easy now love you always Drew, Belinda, Alistair, Hollie and Adrian. 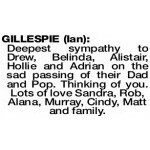 Deepest sympathy to Drew, Belinda, Alistair, Hollie and Adrian on the sad passing of their Dad and Pop. Thinking of you. 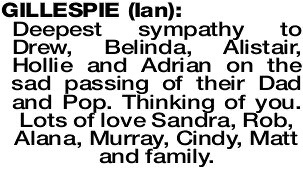 Lots of love Sandra, Rob, Alana, Murray, Cindy, Matt and family. 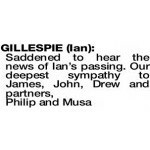 Our deepest sympathy and sincere condolences to the family on the sad loss of Ian. 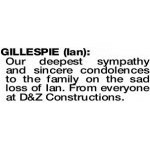 From everyone at D&Z Constructions. 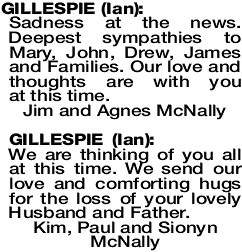 Sadness at the news. 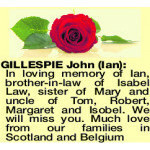 Deepest sympathies to Mary, John, Drew, James and Families. 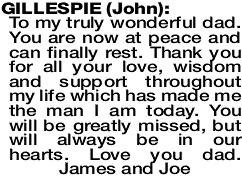 Our love and thoughts are with you at this time. We are thinking of you all at this time. 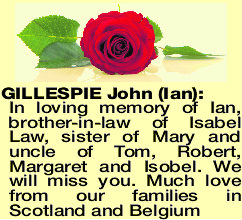 We send our love and comforting hugs for the loss of your lovely Husband and Father.